How To Cook Beets: Slice Them Up, Roast, and Enjoy! For many of us, we see beets at the grocery store and are intimated to buy them; we just don’t know what to do with them. Learn how to cook beets with this simple method! If you’ve had beets before and haven’t liked them, chances are those were boiled (sometimes steamed,) causing them to lose their rich flavor. For those canned beets from Thanksgiving, they are often laden with sugar, artificial flavors, and preservatives to help bring that flavor back. Yuck! Impress your guests and roast them next Thanksgiving. Roasting your beets in the oven brings out a delicious flavor. 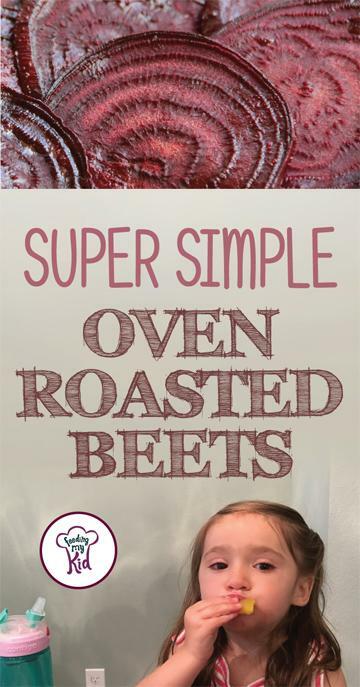 You won’t believe how easy it is to roast beets! The natural sugars and flavors stay right in the vegetable when you roast them. If you haven’t been a fan of beets at all, I would suggest roasting them! This is a simple recipe; absolutely delicious and easy to put together. You can eat them as a side for many meals. You can make this a few times a week or make a huge batch and save for later. Beets are packed with nutrients. They are high in vitamin C, fiber, and essential minerals like potassium and manganese. If you had no idea how to cook beets before, now you’ll have the chance to. You can use regular red beets, golden beets, or a combination of both! Did you know beets are also a great source of folate, which is essential during pregnancy? You can find more facts about amazing beets in this article. Beets come in a lot of varieties, including: red, golden, white, yellow, Chioggia (striped), baby beets and black. Use cookie cutters to shape them and get your kids excited to try this rich and earthy flavored vegetable. My kids gobbled these golden beets up right after I cut them with a cookie cutter. I end up eating the leftover beets while they eat the cute shaped ones. An easy side for any time! Wash your beets thoroughly and trim off the beet stems. Use some gloves for this step. 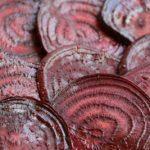 Using a peeler, remove all the skin from the beets then slice them into half-inch discs. Mix the coconut oil, garlic powder, onion powder, and salt into the coconut oil. Coat all your beets in the mixture. Once coated, place them side by side on a baking sheet so that they cook evenly. At the 20 minute mark, check your beets. They should start to look cooked on the outside. Flip the over and bake for another 20-25 minutes until they are tender but not overdone. Enjoy! This dish works well as a side for poultry or meat but it can also be used as a vegetarian meal when paired with other veggies.